Fielding, including throwing and wicket-keeping. 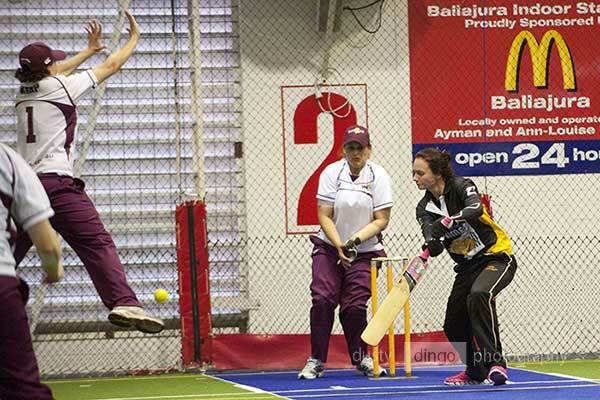 Easily the most spectacular aspect of indoor cricket. 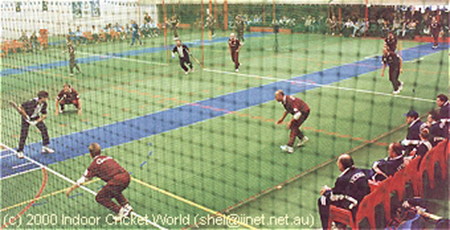 The best fielders in any form of cricket are to be found on an indoor cricket court . . . trust me on this. The fielders all have slightly different tasks, but they all have the same aim - to keep the ball from hitting the net wherever possible, and to take the wickets that present themselves. Those in the front half of the net (i.e., the same half as the batsman on strike) are all very close to the bat. This means any ball struck firmly will be very difficult for them to field (you can't catch what you can't see). It also means if the bowler is bowling short-pitched deliveries, the front-half fielders are in grave danger of being hit by lusty pull-shots or cuts. Yet they are the main source of runouts. Therefore, to maximise the number of runout chances presented (and to keep on friendly talking-terms with your team mates), the batsmen must be prevented from playing firm shots (see "Bowling" above). The extreme importance of the previously mentioned "line and length" should now be apparent. The front-half fielders will most of the time slap a ball back to their wicketkeeper to effect runouts. Those front-half fielders who play at the top level practise slapping the ball back to the 'keeper more than any other skill. However, they must also be adept at taking the ball and throwing it to the fielder at the back stumps. Sometimes the ball does not come direct to hand, and the non-striker would have made his ground by the time they could effect a slap back to the 'keeper. A quick, accurate throw to the back stumps could still be a chance for a runout. Similarly, if a ball is hit quickly and directly to a front-half fielder, and she fields it cleanly and immediately, a quick throw to the back stumps is always going to beat the batsworman running to that end. I am a firm believer in whenever possible having two left-handed fielders on the off-side (for a right-handed batswoman). Left-handers have no advantage over right-handers when slapping or throwing to the 'keeper, but have a huge advantage when it comes to throwing to the backstumper. For the same reasons, I believe the leg-side fielder should always be a right-hander. UPDATE. August 2017. A lot of off-side front-half fielders (still with me?) over the past few years have adopted what I call the jumping screen technique. This involves leaping vertically just before the ball is struck, timing the jump such that if the batswoman plays the classic down-and-up shot, the fielder will be in position to possibly stop the ball boucing oevr her as the ball will reach the fielder as the fielder is at the top of her jump. The better batsmen and women will counter by hitting the ball along the ground, under the jumping fielders and into the net. I feel that if a bowler is being "picked off" by a batswoman and having the down-and-up shot played with ease, the jumping screen will at least force them to alter their approach, making it worthwhile. But if the bowler is hitting that awkward length that prevents the batswoman from playing forceful down-and-up shots, the jumping screen become more for show and makes the front half less effective. The fielder who takes the throws to the back (non-striker's) stumps is usually refered to as the back-stumper. Her job is to take the throws to her and effect the runout, and to patrol the back net. It is not a position for the faint-heated or soft-handed - in fact, if the fielders all throw at 3 million miles an hour and at the ground at the backstumper's feet, it's not a job for anyone. But there are many who love the position. The remaining two fielders are usually positioned on the "two line" (the non-striker's crease line). Whether they stand against the net or more toward the pitch is a moot point, but the favoured shot of a particular batswoman may determine where they best stand. Ideally they will start to move into the front half as soon as the bowler has bowled, to increase the traffic in the front half and to increase the chances of the ball being fielded quickly and a runout effected (see photos below). Of course, if the bowler is dishing up over-pitched or short-pitched deliveries, these two fielders place themselves at great risk of having the ball driven or pulled with force into tender parts of their anatomy (and when a new indoor cricket ball is smashed by the batsman, every part of a fielder should be considered tender and worthy of protection). Once again, we see the importance of "line and length" bowling. In both these photos, the 2-liners can be seen in the act of stepping into the front half. In the top photo, the ball hasn't yet reached the batsman, and the 2-liners haven't quite fully stepped.. In the bottom photo, the batsman has just hit the ball. have already begun their run in both photos. There's throwing, and there's throwing. Most of the time, a throw should be to the wicketkeeper or the backstumper - it is considerably easier to throw within these fielders' reach than it is to hit the stumps, especially from side-on to the stumps. The only time a fielder should have a direct throw at the stumps is if the 'keeper or backstumper are not in position, or the play is so close only a direct hit will effect the runout (or the fielder is so close to the stumps she simply couldn't possibly miss ... I'll let readers guess how many times I have seen good indoor cricketers miss the stumps from two feet away). Trust me, the throw to the fielder is the better option in almost all cases. A good throw will be directly over the stumps, at an easily catchable height. Throws at the head, off to the side, or excessively fast from close by are going to make the 'keeper or backstumper's job very difficult. At this point I was going to do a little spiel on wicketkeepers, but they're such a weird mob, in a world of their own, that I've decided I'll get an experienced 'keeper to write it for me. While I try to talk one into writing it, any offers of contributions are welcome - who knows, your wise words could find themselves, fully acknowledged of course, on these very pages.